Quaerite primum regnum Dei (K. 86), written on October 9, 1770 by Wolfgang Amadeus Mozart (1756-1791) as a composition exercise for admission to the Accademia Filarmonica, Bologna. 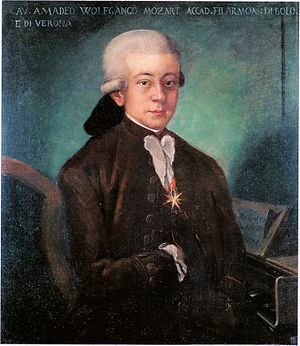 This entry was posted in Mozart, Wolfgang Amadeus (1756-1791) and tagged album, CPDL, January 27, Latin, Matthew, Matthew 6, Matthew 6:33, mp3, Quaerite primum regnum Dei, Seek ye first the kingdom of God, YouTube by John. Bookmark the permalink.